THE MAYBELLINE STORY : My mother's friends included Judy Garland, Mickey Rooney, Deanna Durbins and even Fox girl, Shirley Temple when little Shirley made pictures at M.G.M. with Bill Bojangles Robinson. My mother's friends included Judy Garland, Mickey Rooney, Deanna Durbins and even Fox girl, Shirley Temple when little Shirley made pictures at M.G.M. with Bill Bojangles Robinson. 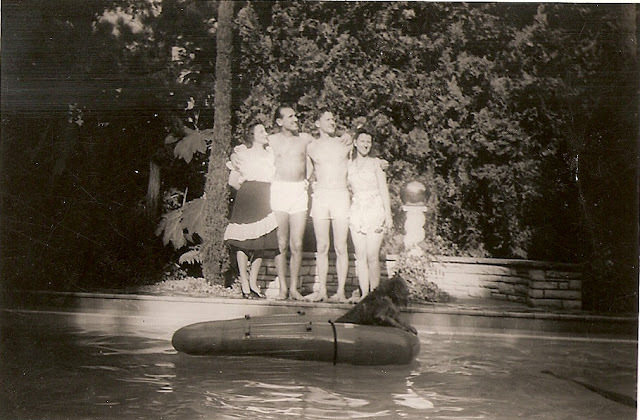 My father's mother, Evelyn Williams, Tom Lyle Williams, my father Bill Williams with his girlfriend, (my mother,) Pauline Mac Donald at Tom Lyle's Villa Valentino in the Hollywood Hills 1941. Sparkie the dog is in the float. My mother Pauline Mac Donald, was a "Studio Brat" and was used to rigorous training at MGM, where she was training to be a professional dancer. Her father Andy Mac Donald, was a special effects pioneer who ran seven departments, including the construction department and supervised hundreds of men who built sets for the studio's musical extravaganzas. Pauline's friends included Judy Garland, Mickey Rooney, Deanna Durbins and even Fox girl, Shirley Temple when little Shirley made pictures at M.G.M. with Bill Bojangles Robinson. As a young girl, my mother was invited to all the cast parties and was loved by everyone who knew her. As a teenager, she spent every free minute at the studio practicing dance routines with her teachers, Bill Bojangles Robinson and Eleanor Powell, who were both impressed by the young girl's ability to move her feet so fast, master complicated steps and work tirelessly. Eleanor Powell believed she had a career at M.G.M., and encouraged some of the biggest producers and directors to keep an eye on her. Pauline's father worried about his only daughter becoming a Louis B. Mayer puppet. He knew how the heartache of rejection many starlets faced could take them to the the point of throwing themselves off the Hollywood Sign committing suicide, doing drugs or drinking themselves into ruin. Her mother, Elna, wanted my mother to have the career she'd always dreamed of, but was concerned Pauline wasn't prepared to deal with the Mayer's Hollywood Studio/Star system, at only 15. My grandmother hoped Pauline would meet a nice boy, get married and have a family someday, so to balance out her daughter's ambitions, she enrolled her in Cotillion hoping my mother might meet well bred young men, while preparing to be a Debutante. My mother met my father, Bill Williams, (Tom Lyle Williams, founder of the Maybelline Company's nephew) at Cotillion and my grandmother got her wish, though not without paying a very high price.